Recent opinion polls have suggested that far-right parties could double their seats in the forthcoming European Elections - and Poland is one country where that movement has become increasingly visible in recent years. A poll by Germany's Bild newspaper, published on 8 March showed far-right parties coming out on top in three of the six countries surveyed: France, Italy and Poland. However, Judy Dempsey, editor in chief of Strategic Europe and senior fellow at Carnegie Europe, says polling ahead of the European Elections can be misleading. "We have to be very careful about opinion polls, because these opinion polls are completely different when compared to national elections. "The reason is that the turn-out generally for the European Parliament elections has been very low. But having said this the populist parties - whether it's left or right - have gone out and really campaigned." She said the message did not seem to be getting across to more centrist parties that the European Elections are important: "The far right wing parties and the populist parties know why it's important but somehow it's very difficult to get the conservative and socialist parties to really go out there and canvas and explain why Europe matters." Why the focus on Poland? Concerns that Poland was becoming a potential hot-bed for the the far right movement increased on 11 November 2017 when 60,000 people marched through the streets of Warsaw to mark Poland's Independence Day. The official theme of the march was religious, under the heading 'We want God" and it was attended by many parents and families. However some of those attending carried banners with xenophobic symbols and words such as "White Europe" and "Refugees get out" - put clearly on display. 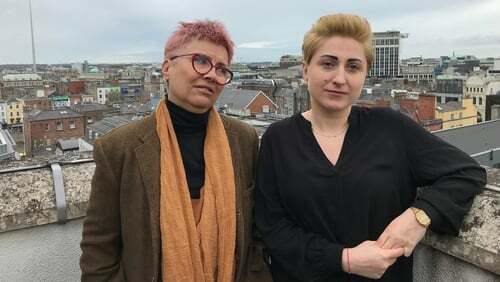 Two Polish women who attended that march are in Dublin this weekend to address Amnesty International's annual conference. They say they are determined to tackle the far-right movement head on. Izabela Mozdrzén and Beata Geppert were part of a group of 14 women who attempted to unveil a "Stop Fascism" banner during the Independence Day celebrations. Izabela told RTÉ News: "We knew that this protest wouldn't be nice. We knew that racist and homophobic and hate speech will be there and banners and we knew that fascist symbols would be there." She said a group of participants grabbed them and tried to tear the banner away. "They were spitting, shouting, swearing, cursing, everything that you can imagine. Some of us were pulled to the ground. One girl was dropped on the street, so she hit her head and she lost consciousness for some time." "The hate pouring from them was terrible," she added. Since then she says complaints that the women made to the authorities about their treatment have not been investigated, whilst she says nine of the 14 women have been fined for obstructing a legal march. Catrinel Motoc, a senior campaigner on human rights for Amnesty International, says whilst it is hard to tell if the far-right movement is on the rise in Poland, it is certainly more visible since the ruling conservative Law and Justice party 'PiS' came to power in 2015. Leaders of that party did not condemn the fascist banners put on display in 2017 and again during last year's march. In November 2017, a party spokeswoman said it was, "impossible to control banners of some 60,000 people in a democratic state". Ms Motoc says the rhetoric of the far right is "less and less condemned by leaders, by politicians that we would look at to uphold people's rights". However Ms Dempsey says she believes the march was "hijacked by a vocal minority". "I remember talking to friends who went out there with their kids and their families and they were really upset about this, so this isn't the picture of Poland." Following last week's attack on two mosques in Christchurch, New Zealand, which left 50 people dead, the country's Prime Minister Jacinda Ardern called for a global fight to root out racist right-wing ideology. It has been reported that the suspected Christchurch shooter has visited Poland and in the manifesto he published online, he called for international solidarity between extremists in Poland and other named countries including Austria, France, Argentina, Australia, Canada and even Venezuela. Ms Geppert said most decent people in Poland reacted with shock to what happened in Christchurch but she said others had expressed their support. She said she will tell those at Amnesty International's conference this weekend that it is now more important than ever to speak out against racism. "In many countries there is the same movement - that is homophobic and xenophobic and we must speak about it loudly," she said. How will the ruling law and justice party fare in these elections? Poland's Law and Justice party PiS won 19 seats in 2014 and could win up to 25 seats this time around. However, Poland's highest ranking European Union official, Donald Tusk, has called for a wide pro-European movement to unite in a bid to oust Law and Justice in these elections. The conservative Law and Justice has also been involved in a bitter clash with the EU over its treatment of the judiciary. But Ms Dempsey predicts it could do well in the European Elections. "They know how the media works. They control parts of the media as well," she said. She said Polish society is becoming increasingly polarised between the liberals and the conservatives and right-wing nationalists, making it difficult to predict who will win. "There's no centre ground and this is the real problem for the European Parliament elections." She said there was a lot of pro-European sentiment among younger Poles with, Eurobarometer surveys showing they are consistently among the most supportive of the EU in Europe.